I was looking for a box blind for deer hunting and was advised to check out the Go Muddy blinds. Once I saw the Bull I knew it was what I was going to get. I got it just before deer season and son and son-in-law got it all set up for me. It was great using it for deer season. It has the 10 ft tower and was easy getting up and down the ladder with the rail. The blind was so quiet and comfortable. I have two young grandchildren who already like to hunt, so this will be great for them to come and hunt in the blind with me. I know it will be used many times in the future. Great hunting blind, very well constructed. Great for hunting with my boys! Great blind setup was a easy very Nice quality would recommend. We’ve had our girls up in the Muddy Bull Blind and they love it as much as we do! Surpasses all other blinds on the market! Just purchased a Muddy Bull Box blind a couple of weeks ago and got it set up this past weekend. Easy to set up and install. Lots of room on the inside, well built box blind. Looking forward to hunting out of it this winter. This past weekend we decided to spend the money on a permanent blind and do it right – Go Muddy, or stay home! The local store had sold the tower and only had the blind. After making a call, we drove 100 miles to another store to buy both, but their blind was baddly damaged (apparently dropped). Fortunately they agreed to sell us the tower. The next day we pulled out trailer load to our hunting camp and were anxious to get it up. After two hours of more scouting and analyzing conditions for best permanent location – 360 visibility, deer gun, deer bow, coyote, turkeys, spring flooding, level ground, future food plot planning, strategic access under different wind conditions in the dark, through the snow, etc, etc …. I got my way. ;o) We were very impressed with the weight, strength and design of the tower. Assembly is definitely a two-person-with-skid steer-undertaking! It also helped to follow the directions closely and have the best tools for the job. Hardest part? Searching for nut and lock washers dropped in the tall grass. (Do you offer marriage counseling for couples who tackle joint assembly?) This blind is fabulous! Well designed, well built, sturdy, insulated comfort, but most importantly, it is ideally functional and offers the us the best opportunity to observe and capture wild game of all sorts and sizes. We will add the blackout/camo screen package for the windows, bow hook and another Muddy chair. Looking forward to an occasional cat nap in our bull blind too! I had one installed on my Illinois farm. It is well built and easy to set up. It has good all around vision. Best blind I could find. Easy to assemble tower. Will need se.veral guys to stand it up Love the blind. If you want comfort buy a muddy! I’m a bow hunter and they work great and are built well! Just got the blind with 10ft tower set up today. Looks great and built right. Should be able to endure many years of use. The Muddy Bull Blind has worked well for us at our ranch. The structure is very well built, and quiet. The stand is sturdy and well designed. We were able to take out several coyotes on our first use of the blind. Great product! Quiet, windows operate super easy, great on controlling scent. After 3 back and 3 shoulder surgeries, I can’t do tree stands any longer. Your blind puts me back in the air with ease and comfort. The Muddy® Bull Box Blind Combo is the best box blind currently on the market. Like most box blinds on the market today, assembly of the tower is straight forward and is quick if you have an impact wrench to tighten all the nuts.The vertical windows are great for using a vertical bow and the horizontal windows are wide enough to use a crossbow. The blind is insulated and the windows are extremely quiet when opened. What separates The Bull Box Blind from the others on the market is the accessories Muddy® has for The Bull Box Blind. The Bull Box Blind comes with a shelf with a built in cup holder. On the underside of the shelf, there are two holes drilled with thread inserts to add in accessory hooks. The shelf is also designed to hold a towel dowel and there is a gun rest designed into the shelf. Muddy® also made the carpet removable for easy cleaning. In addition to the accessories built into The Bull Box Blind, Muddy® sells a bow holder than can be mounted in various spots in the blind. Muddy® also sells a window curtain kit that not only has a camouflaged see through layer, but it also has a black out layer with a small flap that can be opened to see out of if one needs to see out of the blacked out window. Without the accessories, The Muddy® Bull Box Blind Combo is a run of the mill box blind, with the accessories Muddy® has built into The Bull Box Blind and with the additional accessories Muddy® sells for The Bull Box Blind, The Bull Box Blind is, without a doubt, the best box blind currently on the market. Great size stand. Nice large windows. Well constructed. I did lengthy research in box blinds for the past couple years. I finally made a decision that Muddy was the best on the market. Not only am I excited to hunt out of it…..my 7-year-old son is super-excited!! Lets go hunt!!!! I just received my Muddy Bull Box Blind. After looking at other box blinds on the market, yours is by far, the best built out there. Great shot placement and easy access from all angles. Thank you for building a quality product, with the hunter in mind. I look forward to many seasons of memories and quality time hunting with my daughters. This is by far the best blind out there. I have been shopping and comparing blinds for over a year and nothing is as good as this blind. Need to have the proper equipment to set it up but what a blind. Height, door, windows, insulation, design, sturdy, accessories, and comfortable. Look forward to even more innovations and buying a few more. Go Muddy or Go Home. I recently purchased one of The Bull box blinds and towers along with the Muddy chairs for the blind and the window coverings. When I received the first blind it had some damage on it and I sent it back right away. Although it was difficult to talk to someone directly and get questions answered right away everything was taken care of with not too many questions asked, which was greatly appreciated(Thank you Jenna)! I did not plan on buying a Muddy box blind due to the price but after looking at multiple other box blinds on the market it was very evident who was making the best box blind out there. Thanks for making great products and overall having good customer services. It would be nice if it was a little easier to talk with someone on your end in the future with issues. I look forward to hunting out of the blind with my 5 year old son and his grandpa and his great grandpa. It is going to be very comfortable and hopefully aids us in shooting bigger bucks!! The outdoors is all about having great times with friends and family and creating memories that will last forever. You at Muddy are creating great products to help with that!! Great blind, replaced a home made version. Looking forward to a dry easy to hunt from blind. This year I got my first Muddy and tower. Looking forward to hunting out of it. Got my Muddy Box Blind ready for the season!!! I’m so excited to have such a weather resistant blind to stay a little warmer in, my old bones can’t take the cold for that long anymore!!!! I will also be nice to take my grand children with me and they can at least wiggle a little bit!! Sure it will last for many years!! 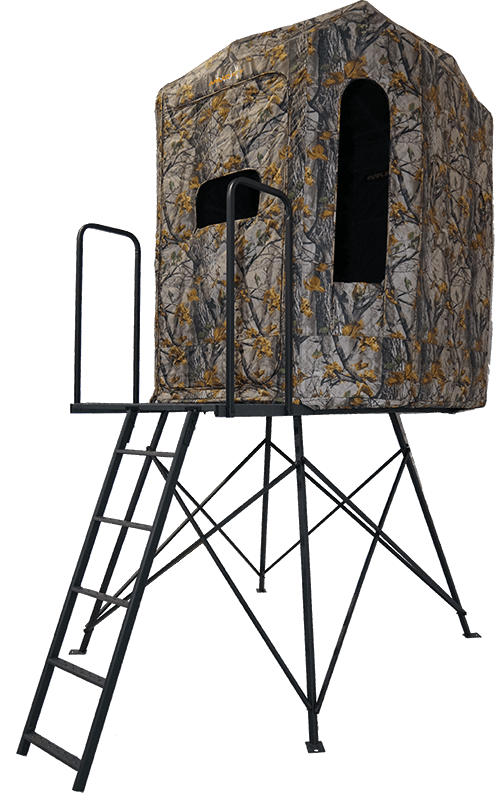 Awesome blind…very durable…spacious…my hunting will be much more enjoyable because of my muddy tower! I’ve been looking at numerous blinds for years and the Muddy Bull definitely caught my attention. This blind is built like a tank and has all the bells and whistles for gun and bow hunting. Being air-tight and quiet as a mouse, this blind adds a whole now dimension to my game plan for many falls to come. The concepts of this box blind have impressed me more than any of the previous box blinds I have used. I have used many. Just received my blind this weekend. I am excited about setting it up. Perfect blind to teach my grandchildren to hunt from while keeping this old man comfortable. My wife thinks she might want to sit with me in it too. I purchased the muddy bull blind for my farm on 8/5/16. I plan on getting it set up asap. I bought the blind to spoil myself and my family and friends. I am very excited to get it up and to hunt out of it. This is the best blind I’ve ever hunted out of. The windows were a great idea and they’re very quiet to use. All in all this is a great quality blind that I’ll be hunting out of for the years to come! The Muddy Bull Box Blind is named adequately because this thing is a BULL! Very impressed with the construction and can’t wait to hunt of this blind for the next 20 years!! WHERE CAN YOU FIND YOUR MUDDY BOX BLIND? Type in your City or Zipcode. Whether its teaching the little ones the basics of hunting or going out with an old friend, the Penthouse has plenty of room to spare. Built with the same advanced structure as the Bull, while offering hunters enough space to spend long comfortable hours out in the field, the Penthouse is our largest box blind yet! Walls: Therma-Tek Panels - Insulated Design provides Thermal, Scent, AND Noise Control! The Muddy Bull Box Blind is the pinnacle of blind advancement in the hunting industry. It is hands down the best box blind on the market. Besides the insulation, rugged construction, window placement, dead quiet features, and numerous hunter driven structures like a built in gun rest, what separates the Bull Box Blind is the accessories that can accompany it. With a host of built in mounting options for accessory hooks and holders, the fixtures create the ideal setup for hunting. Overall the Bull provides a comfortable, solid hunting setup ideal for all hunting blind applications! Insulated Design provides Thermal, Scent, AND Noise Control! The Gunner box blind is the younger brother of the Muddy Bull box blind. From the same genetic pool, the Gunner features all of the bells and whistles of its older brother, the Muddy Bull, just in a smaller package. This offers hunters the same superior quality they have come to expect from the Muddy Bull Blind, now in a smaller and more budget friendly blind! Built by hunters, for hunters, the Soft Side 360 blind is our most portable and affordable box blind. The advanced insulated fabric walls include an ultra-dark interior to remain hidden, while the silent zipper windows allow to go undetected. The Soft Side 360 blind can be used on its own or elevated on the Deluxe 5' Tower or the Deluxe 10' Tower for the best combination for your hunt! The quality line of Muddy hunting products recently expanded yet again. With the addition of a brand new box blind for 2017, the Gunner box blind now joins the ranks of the top notch hunting products now available to hunters. Muddy’s box blinds the Bull and the Gunner, both abide by Muddy’s tradition of offering features that go above and beyond hunter’s expectations. Check out the box blinds below and their features that out-compete any other hunting blind on the market. If you are wanting to become a box blind dealer scroll down to the dealer information.